RSA - Approved Driving Instructor , ADI 35678. RSA - Approved IBT Centre & Trainer . 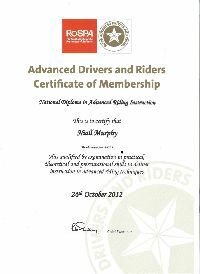 RoSPA Diploma Certified Advanced Rider & Registered Instructor . Over 34yrs of Biking Experience . *Opening times can vary , and are weather dependent. We supply , Insurance , Gear , School Bikes , Private Training Compound . Private Training Compound - Approved by the RSA . School Bikes Available , 125cc , 250cc , 500cc , 600cc , 650cc . With your safety our priority ,all our School Bikes are maintained to the highest order, with Preventative Maintenance Records available. Call , Text or E-mail , Remember - All you need is your permit ! Vouchers Available for anyone to purchase ! The ideal Gift for the "Biker" in your house , remember you are helping them become a safer rider. ** Contact us for more details . 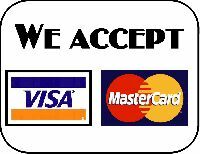 ** We are now accepting Card payments , in person only . Reasons why you should use us for training ! If you are ringing around to get the best price , thats understandable . Price is important , but quality training is even more important . There are a few things we think you should know about us , before making any booking . We have a very simple but very effective approach to Training people , its seems this has worked for us since we started , with our business increasing every year . We specialise in Motorcycle Training only . Your safety is always our priority. Our School Bikes & PPE are well maintained, suitable for Training and safe . Our Bike to Bike Radio's are modern and easy to use . Our Facilities are accessible Fit for Purpose and Approved by the RSA . We tailor the training to match your ability by dealing with you on a 1:1 basis . We will never ask you to do something that you may not be ready for , or happy to do . We will never take you out on the road with being completely happy that you are prepared. We will not put pressure on you to participate in or complete any course . We want you to enjoy the learning experience , as these are skills for life. We take every student on an individual basis , and unlike some schools and instructors , we are not interested in rushing anyone through any course . We want to improve your competence , and watch your confidence grow accordingly . We guarantee you get what you Pay for . Quality Training , from a professionally qualified training provider .